ICSE 2007 will be held in Hilton Minneapolis Hotel. The conference has a block booking of rooms, which will be held for reservation by ICSE participants. The hotel cut-off date is May 1st 2007. Book early to ensure your room at the conference hotel! Are you a graduate student? Have you thought about applying for SIGSOFT CAPS funding? 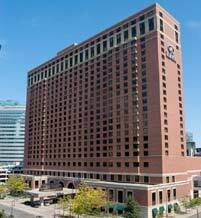 The Hilton Minneapolis Hotel is located in the heart of downtown, connected by skyway to the Minneapolis Convention Center as well as many of the city's finest attractions. The Minnesota Orchestra is next door and The Guthrie Theatre, Walker Art Center, fabulous shopping and superb restaurants are just a short stroll away. The Hilton Minneapolis Hotel is an elegant Victorian brick building that rises 25 stories above the center of one of America's top cities. The hotel has wireless internet access, self-service check-in kiosks and a full service business center. The hotel has high-speed internet access available in all 821 guest rooms. It features an extensive fitness center with an indoor pool, whirlpool, top of the line exercise equipment and sauna that are available to all guests.